NASA/ESA Hubble Space Telescope has obtained the clearest pictures ever of our solar system's most distant and enigmatic object: the planet Pluto. The observations were made with the European Space Agency's Faint Object Camera. The ninth and last real planet known, and the only planet that has not been visited by a fly-by spacecraft, Pluto was discovered just 60 years ago by the American astronomer Clyde Tombaugh, who was searching for the source of irregularities seen in the orbits of Uranus and Neptune. It has become apparent since then that Pluto is a very peculiar object. Its orbit is tilted and is more elliptical than the orbits of any of the other planets in the solar system. Pluto also rotates upside down with its North Pole below the plane of the solar system in the opposite sense of the Earth and most of the other planets. Pluto is smaller than our own Moon and also denser than any of its neighbors in the outer solar system. But, perhaps, its most fascinating property was uncovered only 12 years ago when a huge companion "moon" called Charon was detected from ground based photographs. Subsequent investigations have shown that Charon is about half the size of Pluto making it the largest known satellite relative to its planet in the solar system. In fact, because of this, Pluto is often referred to as a double planet. The rotation period of the Pluto-Charon system is a mere 6 days. A recent Faint Object Camera image of Pluto and Charon is shown in the upper right hand frame of the accompanying photograph. This image is the first long duration HST exposure ever taken of a moving target. In order to avoid smearing of the images, ground controllers had to pre-program the HST spacecraft to track Pluto extremely accurately and compensate exactly for the "parallax" introduced by the combined motions of Pluto, the Earth and HST in their respective orbits. Pluto is currently near its closest approach to the Earth in its 249 year journey around the Sun, and is approximately four and a half billion kilometers away. The bright object at the center of the frame is Pluto while Charon is the fainter object in the lower left. Charon is fainter than Pluto because it is smaller and, probably, because its surface is covered by water ice whereas Pluto is thought to be covered mainly by the more reflective methane frost or snow. As indicated in the diagram at the bottom of the photograph, Charon's orbit around Pluto is a circle seen nearly edge on from Earth, with a radius of almost twenty thousand kilometers - a distance equal to approximately one and a half times the diameter of the Earth. At the time of observation, Charon was near its maximum apparent distance from Pluto, so that its angular separation was about nine tenths of an arcsecond. Because of the peculiar orientation of the Pluto-Charon orbit with respect to our line of sight, Charon approaches to within less than one tenth of an arcsecond of Pluto every three days. Due to the physical proximity of the two planets and the great distance to the system, it is extremely difficult to clearly resolve the pair from the Earth except in exceptional circumstances. 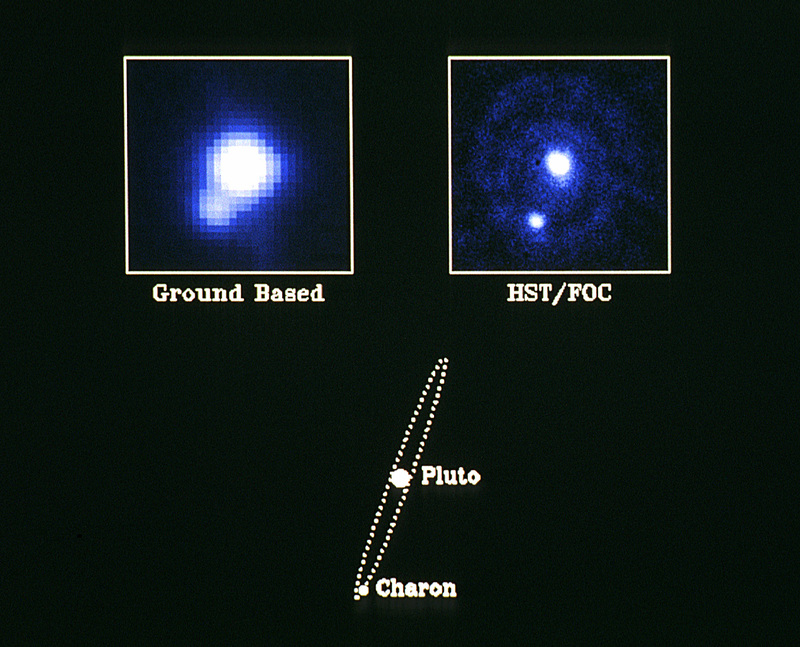 The best ground based image of Pluto and Charon ever taken to date is shown in the upper left hand frame in the accompanying photograph. This image was taken with the Canada-France-Hawaii telescope in Hawaii. The superior resolution of the FOC image is evident. Further HST observations of Pluto and Charon will be extremely important in elucidating the nature and the origin of this fascinating and frigid world where the average temperature approaches minus 215 degrees centigrade - only 58 degrees above absolute zero. Although the "fog" surrounding the images caused by the spherical aberration of the primary mirror prevents the FOC from resolving surface features, several other critical pieces of information can be extracted from continuing FOC observations of these objects. Detailed analysis of the brightness variations of the two planets will provide a wealth of information on their surfaces and atmospheres which are impossible to obtain from the ground. Precise measurements of the orbital parameters of the Pluto-Charon system are now also possible. This will enable astronomers to measure the individual masses and densities of the two objects - thereby providing important clues to their origins. One possibility is that objects similar to Pluto and Charon were created in great numbers in the outer fringes of the primordial solar nebula, but the majority of,these "planetary embryos" were either expelled from the inner solar system or gobbled up by the giant planets Jupiter, Saturn, Uranus, and Neptune. Only Pluto 'and Charon survived independently to this day. Continued monitoring of these two fascinating objects at the outer edge of our solar system throughout the lifetime of HST will perhaps help astronomers understand the nebula from which we all originally formed. Notes: The left image was taken with the Canada-France-Hawaii telescope in Hawaii.